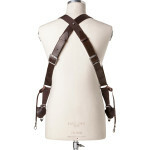 Sideburns is a stylish and resilient camera strap, handcrafted from vegetable-tanned Italian leather and braided string. Carry multiple DSLRs with ease, to switch effortlessly between camera systems as you capture those fleeting moments. Designed to hold up to three camera systems, this adjustable body strap distributes the weight of your kit, for comfortable wear all day long. Strong and secure, this harness combines convenience with peace of mind when shooting with multiple cameras. Suspend two cameras by your side and wear an optional third system across your chest, to select the perfect lens for every shot. Rest assured that your cameras are secure; screw-in tripod mounts and clip connectors are designed to hold firm on the move. Instantly bring your camera to eye level to capture those special moments. The D-ring design allows fluid movement when switching between cameras. Available in two sizes, the adjustable cross-body strap moulds to your figure, to ensure comfortable wear for hours at a time. Choose a design that suits your style. Handcrafted from the finest hide, this leather strap is available in black or dark brown. 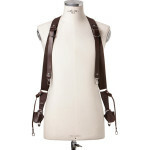 Sideburns is a luxury leather cross-body strap, designed to enhance your workflow and ease the burden of your kit. 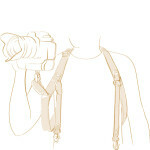 Made to hold up to three cameras, it’s a secure but comfortable camera strap that’s suitable for men and women. Suspend two DSLRs and lenses safely by your side with the secure screw-in connectors and safety clips, and wear a third camera across your chest with the optional attachments. The criss-cross design distributes the weight of your kit, with adjustable straps to suit your height and size. Made in Italy, this vegetable-tanned leather strap is available in two sizes, in black or dark brown leather. Perfect for events and outdoor photography, it’s a secure, comfortable and stylish way to carry your equipment. Vegetable tanning brings out the natural beauty of the leather, to create a strong, resilient and handsome accessory that will endure for years to come. 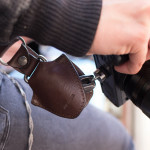 However, to protect the condition of your camera strap, apply a natural leather wax or spray to treat the leather. Protected by a two-year manufacturer’s warranty for faults and defects, this product is designed to acquire character with age. Barber Shop uses artisan techniques to create stylish and functional bags and accessories for the contemporary photographer. 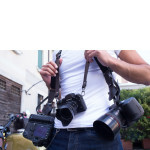 Made in Italy, their collection of camera bags, straps and clips are renowned for their durability and handsome design, trusted by male and female photographers worldwide.